Lightning formation is preceded by an increase, higher than 10 KV/m, in the ambient electric field. This natural energy is directly accumulated by the triggering device of the DAT-CONTROLER® lightning conductor, which automatically turns into pre-control situation. Lightning discharge approach provokes an intense and sudden increase of the electric fields, thus originating a lightning strike risk area. If this risk area takes place in the zone protected by the DAT-CONTROLER®, the sudden variation of the electric field simultaneously actions the control system of the DAT-CONTROLER® which, in synchronization with lightning approach, provides the safest controlled discharge path to earth. Atmospheric electric field as its only power supply. Totally autonomous and maintenance free. Functioning can be tested at any moment. 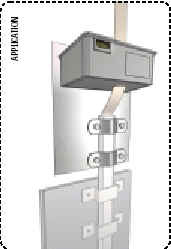 Radius of protection certified for each model and level. Gain in triggering time values specific for each model. Effective performance in weather condition.Insulation superior to 95%. Effective full operation after being submitted to several lightning currents. LCOE - Central Official Electrotechnics Laboratory - Ministry of Industry and Energy (Madrid). SEDIVER - High Voltage Laboratory of Bazet (France). Faculty of Physics, University of Valencia (Spain). Institute of Electric Technology (ITE), Polytechnic University of Valencia (UPV) (Spain). AIMME - Technologic Metal-Mechanic Institute (Spain). EDF - Electricité de France - High Voltage Laboratory Les Renardières (France). BET - High Voltage Laboratory of Blitzschutz & EMV Technologiezentrum (Germany). 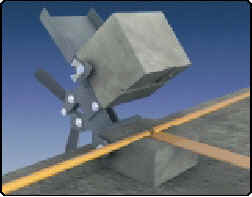 For the design of any External Lightning Protection Installation a prior survey should be conducted to determine the protection level to be considered, the Early Streamer Emission lightning conductor location(s), the down-conductor path(s), the earth termination system location(s) and type(s). The main part of this survey is the direct strike risk calculation. The higher risk, the higher required protection measures (for a very high risk, LEVEL I OF PROTECTION, for a medium risk, LEVEL II OF PROTECTION and for a standard risk LEVEL III OF PROTECTION). For the maximum safety, Standard UNE 21 186 and APLICACIONES TECNOLOGICAS, S.A. recommend LEVEL I OF PROTECTION. The normative Annexe B of Standards UNE 21 186 and NF C 17-102 constitutes the LIGHTNING RISK ASSESSMENT GUIDE AND SELECTION OF PROTECTION LEVEL. 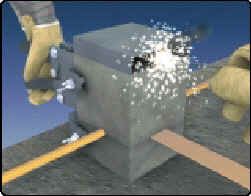 APLIWELD is a welding system that employs an exothermic reaction to obtain on-site, homogeneous connections among conductors. 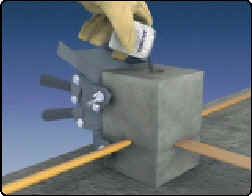 The procedure consists of fixing the conductors to be welded using a graphite mould. Welding mixture and starting powder are also placed inside this mould. When a spark is applied, it starts the reduction of the copper oxide by the aluminium. this reaction is highly exothermic, thus reaching a high enough temperature to melt both the preparation and the conductors. The whole mass therefore becomes homogeneously welded. 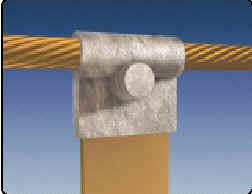 The conductivity of the connection is the same or even higher than in the conductors, being able to stand high currents and avoiding corrosion problems that could appear with simple mechanical joints. 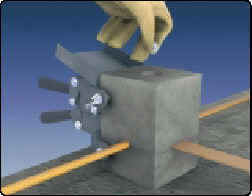 The graphite mould is semi-permanent and specific to each of the conductors to be welded. The amount of welding mixture must also be selected according to the welding size desired. When conductors are welded, the mould is opened using the handle clamps and cleaned, being then ready for another welding. As it has no need for an external energy supply, the process is totally autonomous. This, together with electrical, mechanical and corrosion-resistance characteristics makes it especially suitable for welding conductors forming part of the external lightning protection system, as well as for any earth termination system. 1. 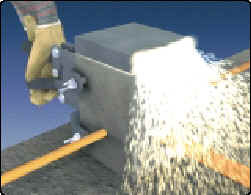 Pre-heat the mould and the conductors to be welded during a sufficient period of time using a welding torch. Place the conductors inside the corresponding holes in the mould. 2. Once the mould is closed and fixed by the clamps, place the tin disk at the bottom of the crucible, thus avoiding the loss of welding powder. 3. Pour the welding powder into the crucible cover it and its borders with enough starting powder. 4. After closing the security lid, light the starting powder using a flint gun, welding torch or flare. 5. The exothermic reaction takes place. 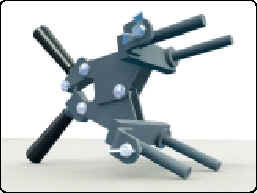 It is recommendable of fasten the mould, firmly holding the clamps during the process and not to stay too close to the spark outlet hole. 6. Wait for 1 minute before opening the mould and the final welding will have be obtained. Clean the mould with the proper tools. If the mould is still hot, it can be used for another welding without pre-heating.